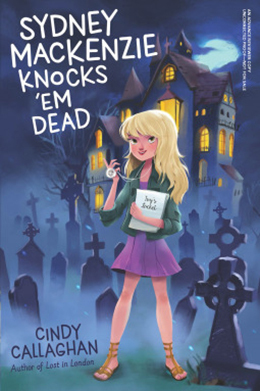 Sydney Mackenzie Knocks ‘Em Dead is Cindy Callaghan’s latest middle grade novel and it also happens to be nominated for this year’s Agatha Award for Best Children’s/YA novel. Sydney Mackenzie is tween who aspires to be a filmmaker. All seems to be going as planned until one day her parents announced that they have inherited a cemetery – in Delaware! Moving across the country and into less-than-lavish haunted house was never part of the script. Right from the beginning, Cindy Callaghan creates Sydney to be a character young readers will relate to. Sydney has enough foibles to allow for growth in her character across this fun novel. Sydney Mackenzie Knocks ‘Em Dead is a hybrid of paranormal mystery and historical mystery with enjoy of-the-minute tween angst to make Sydney a worthy successor to Nancy Drew. The ghostly elements quickly move aside once the true mystery of the path engages the children in exploration. Like most books for young readers, Sydney Mackenzie Knocks ‘Em Deadprovides a diverse cast of secondary characters giving the book a wider appeal. Sydney’s group of friends is sure to expand as the series progresses. The Delaware setting is unique and the mystery at the core of the novel – relating to the Underground Railroad – stems directly from the novel’s locale. Those looking for a way to entice young readers to the mystery genre are encouraged to give Sydney Mackenzie Knocks ‘Em Dead a look.